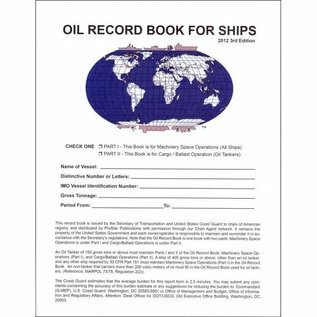 Oil Record Book for Ships[OILRECLOG] This record book is issued by the Secretary of Transportation and the United States Coast Guard. It remains the property of the United States Government and each owner / operator is responsible to maintain and surrender it in accordance with the Secretary's regulations. Note that the Oil Record Book is one book with two parts; Machinery Space Operations is under Part 1 and Cargo / Ballast Operations is under Part II. An Oil Tanker of 150 gross tons or above must maintain Parts 1 and II of the Oil Record Book. A ship of 400 gross tons or above, other than an oil tanker, and any other ship required by 33 CFR Part 151 must maintain Machinery Space Operations (Part 1) in the Oil Record Book.